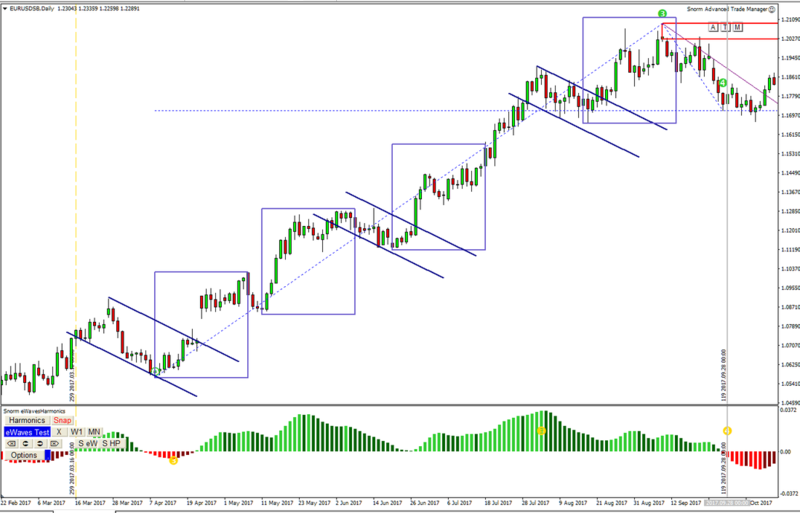 This page has been compiled to answer some of the most frequent questions that we receive about using MT4. 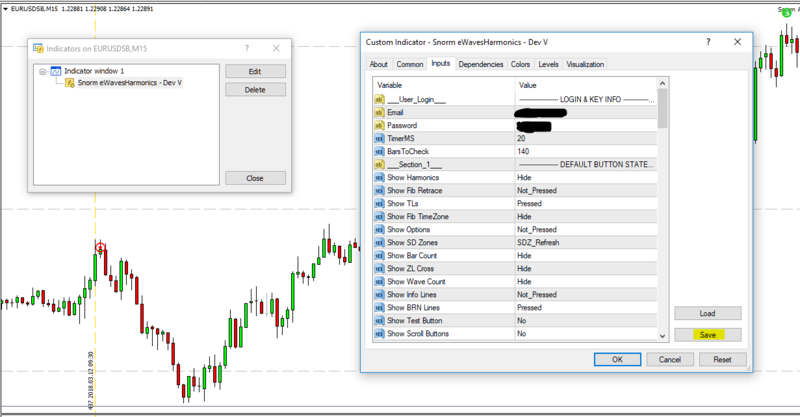 Where do you copy your indicators, scripts and EAs to? ​5. 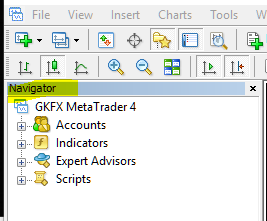 Restart MT and your program should appear in the appropriate MT navigator window. Click on the + symbol to expand the list. 2. If you're just sharing your picture with some friends, the easiest way is to do it with a weblink. 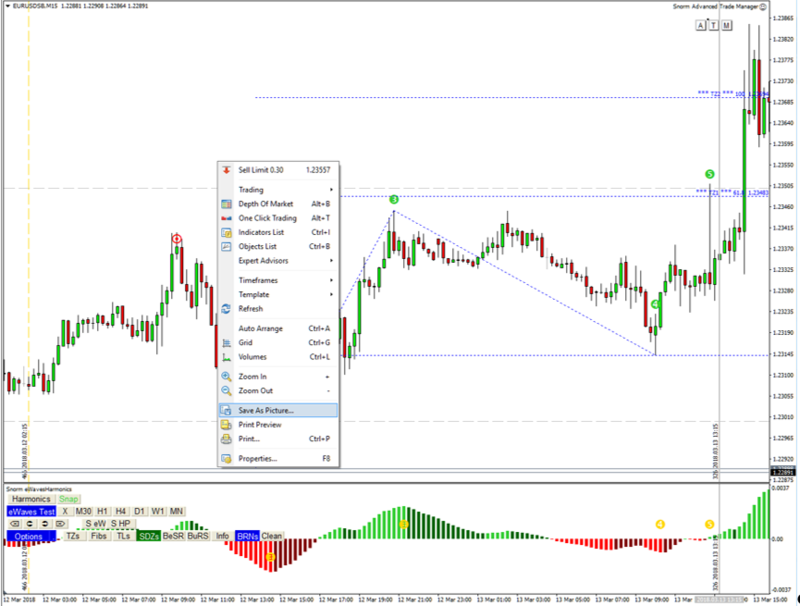 Note: some people report that their MT4 just hangs after doing this without the 'Save As Picture' options showing: press the ALT key and you should see it; your MT4 isn't hanging. If your programs don't appear to be working or you're getting strange issues, click on the 'Experts' tab, at the bottom of your MT4. The latest messages appear at the top - do they report any errors? Try refreshing your chart, e.g. by switching timeframes, to see if the error goes away. Sometimes there aren't enough bars in history or the data didn't load quickly enough, for your program to do what it needed. A timeframe change and back will often resolve the problem. If not, you can right-click on the error to copy it and send to the coder of the program. Can you not see your trade levels (entry, stop loss and target) on your chart? 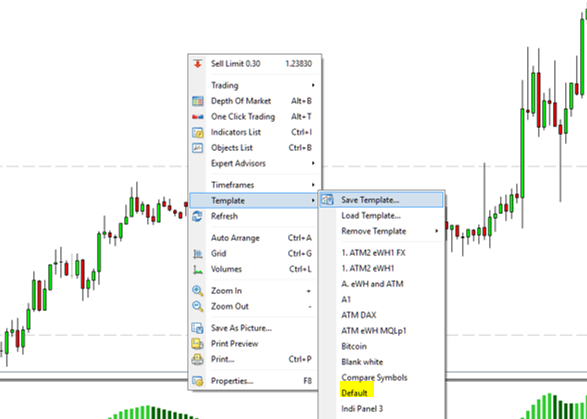 MT4 provides an option for that so you can click and drag the levels after your order had been entered. 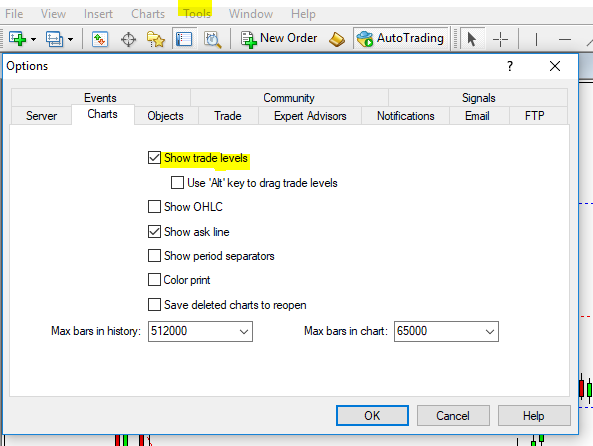 From your MT menu, select Tools, then Options and tick the 'Show trade levels' box..
​The quick way to enter your favourite 'Inputs' for an EA or Indicator. Give the 'set' file a meaningful name and save it. When you add the same program to another chart, you can click on the 'Load' button, and chose the relevant 'set' file - no need to keep entering all your details when you load the program. 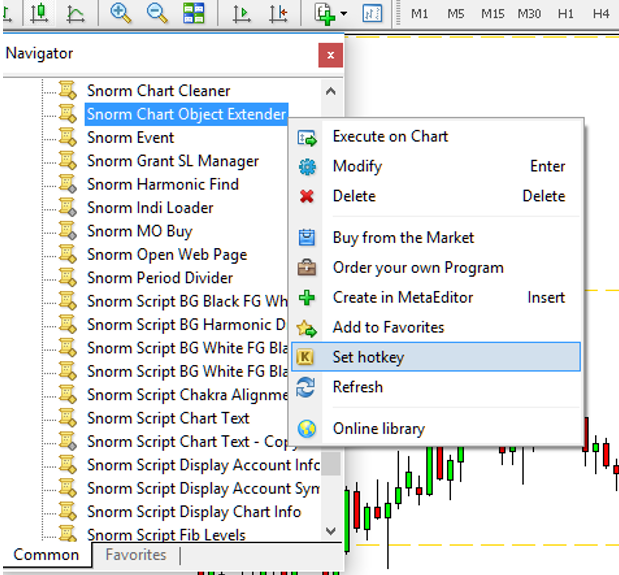 Alternatively, or additionally, you can save a chart template with your program setup. 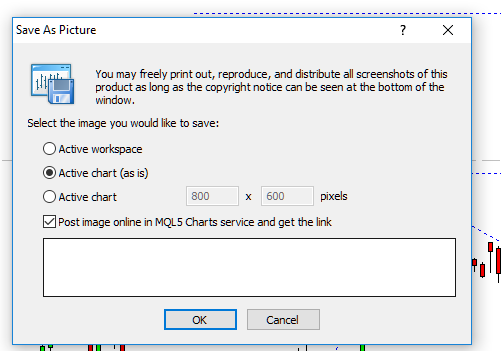 Right-click on the chart, select Template then save with a meaningful name. Top Tip: to have any charts, that you open in the future, use the same template, save as the 'Default' name shown in the list. Profiles allow you to organise charts into logical groups and reduce the burden on your processor from having too many charts constantly updating. For example, you might want to have separate profiles for M1, , H1 and D1 charts, so you can just switch profiles at certain times of day. There are times when it's very useful to duplicate objects on your chart, e.g. for identifying where price has moved in similar time and price cycles, or for repeating trend lines. 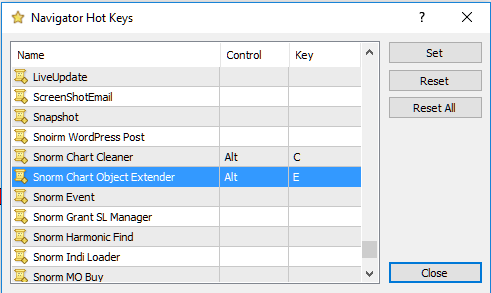 It's simple to do - just hold the CTRL key down when you select an object with your mouse, then move the duplicated object to where you need it. In this example, we created one rectangle and one diagonal line - the rest are just copies. 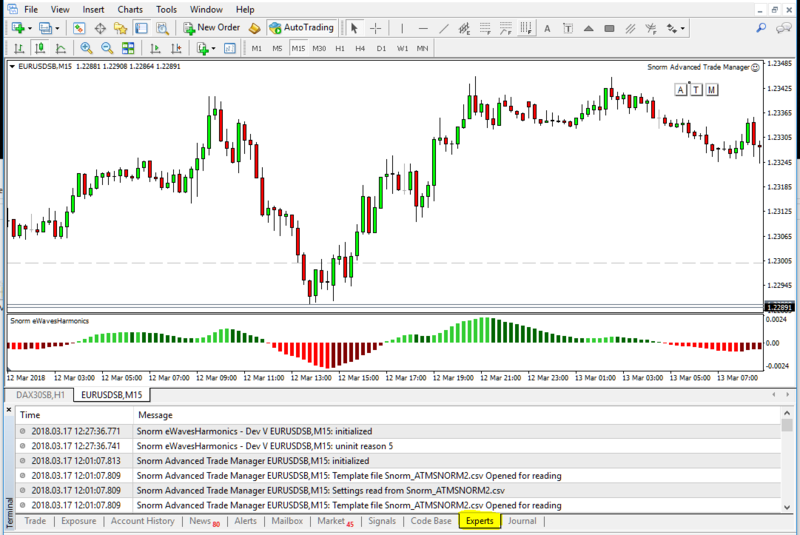 You can assign hot keys to your programs for quick loading on to charts, without having to navigate the navigator. This is particularly useful for one-time use Scripts. For example, I use ALT E to apply my object extender script to the chart (available from the Free Stuff web page) . Just be careful that you don't reassign some of the MT4 shortcuts to your programs and lose quick-access things like CTRL N to open the Navigator window, or CTRL O for Options. If someone asks you to check a particular setup on a symbol at a certain time, it can be rather tedious to open the chart and scroll to that time. There is a quicker way ... just press ENTER and instruct MT to open with the 'Fast Navigation Box' in the bottom left of your chart.